Morning is my favorite time for photographing because much of the world is still sleeping or running through rituals that prepare people to head off to their daily routines. Morning is also a wonderful time for walking. You experience the world differently then. Already an hour after the sun has risen most city-scapes return to their concrete medium grey dull tonalities. It is difficult to stick to a plan for a brisk walk when so many image possibilities surround you, but to that end I usually leave my “big” camera bag at home. Instead I will clip a Canon PowerShot S95 to my belt determined to only “draw it” when something is absolutely stunning. Well, isn’t everything stunning? The captures I am sharing from last week were taken on my morning walks when the sun was pretty determined not to rise from behind its morning cloud coverage. Along the walk from Crissy field to Fort Point I noticed it was low tide and more of the beach was accessible. 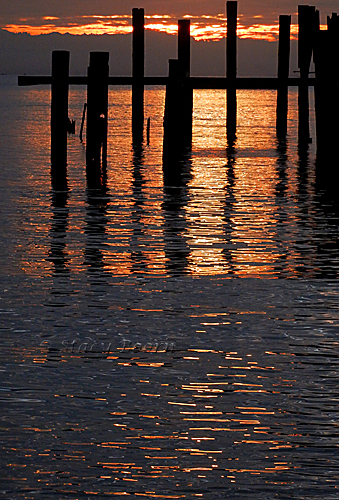 As the sun began to rise it shone through a sliver of clearing between the distant East Bay Hills and the cloud coverage. The small aperture, and wide angle provided maximum depth of field and the “staring” effect of the sun. 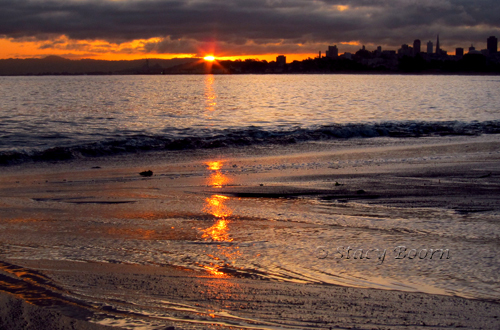 From a low angle you could see the sun’s orange rays reflected on the wet beach. The KOI image was taken at the Japanese Tea Garden in Golden Gate Park on a rainy dreary day. The tea garden opens at 9 AM and if you are lucky you might even get in a little earlier when the gardener opens the door and invites you in. Right now everything is so meditatively beautiful with cherry blossoms and emerald green grasses and deep purple Iris blooming. It was so dark I thought about keeping that PowerShot in its case. But you can make creative choices with that kind of dim light. Seeing the koi in the pond I choose to set the camera at ISO 100 and the smallest aperture opening. This gave me a slow shutter spend which would definitely make every image blurry. 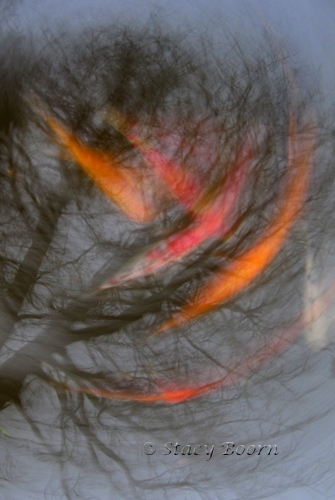 So I rotated the camera while photographing the koi and a tree reflection in the pond. This entry was posted in Weekly 2. Bookmark the permalink.